Picking the right vintage isn't the most important factor in choosing a wine (a truly good producer will make good wine even in difficult years) but knowing your 'holy grails' from your 'wholly crap' years can come in handy. But even the most seasoned wine nerd has trouble remembering every good recent vintage for every region or country, so it pays to know where to look, whether your memory just needs refreshing or you want to start making better-informed choices. Each year/region is linked so, for instance, if you're looking for 2007 white Burgundy, it will take you to the ones they have in stock from that year. 1. They don't, unfortunately, include New World vintage information. 2. They do, however, have an Android app as well as an iPhone app - hooray! Both BBR and The Wine Society have put a huge amount of time and effort into making something seriously handy, especially in app form, which means you can even get advice on a last-minute supermarket wine dash when you're trying to work out which bottle of Rioja or Chablis you should grab. Top marks to them both. 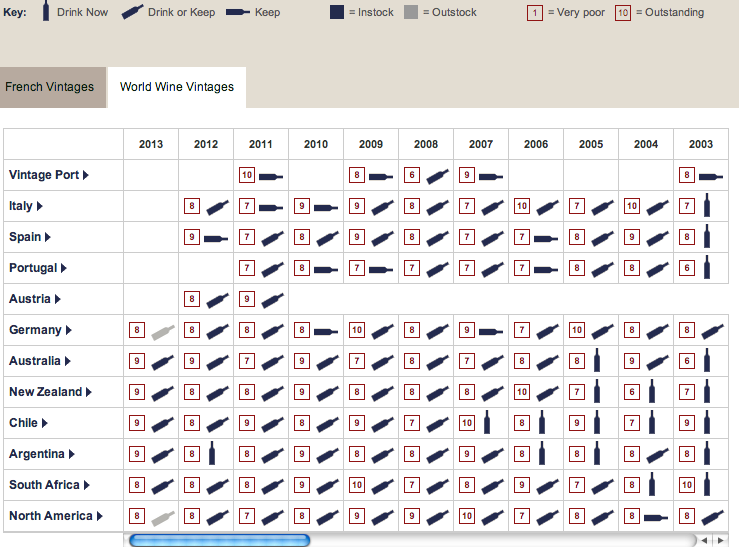 From the big man of 'marking a wine out of 100' himself, you'd expect a pretty nifty vintage chart, and you won't be disappointed. 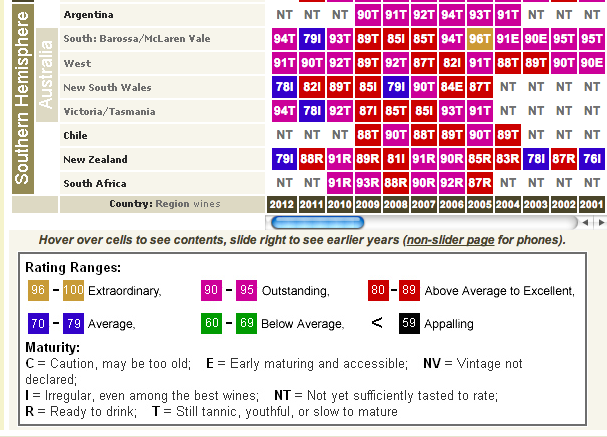 While it's not quite as user-friendly as BBR or The Wine Soc, it does tickle the fancy of those who like an extra-geeky dollop of detail in their vintage charts: it goes back to 1970 and splits the categories into much narrower fields. Also, in typical Robert Parker fashion, you get a score out of 100 (it's colour-coded, which makes it easy to scan along and find the good stuff) and anything under 59 is described as 'appalling'. It's quite fun to scroll through and find the 'appalling' vintages. 2002 Chateauneuf is a no-go. For pure megalolz and ultimate geekery, you can not get better than this. The Telegraph and Berry Brothers teamed up and very cleverly made an interactive vintage chart (it only covers French wine regions, I'm afraid) that means you can get all your wine smarts whilst having fun and looking at something pretty. 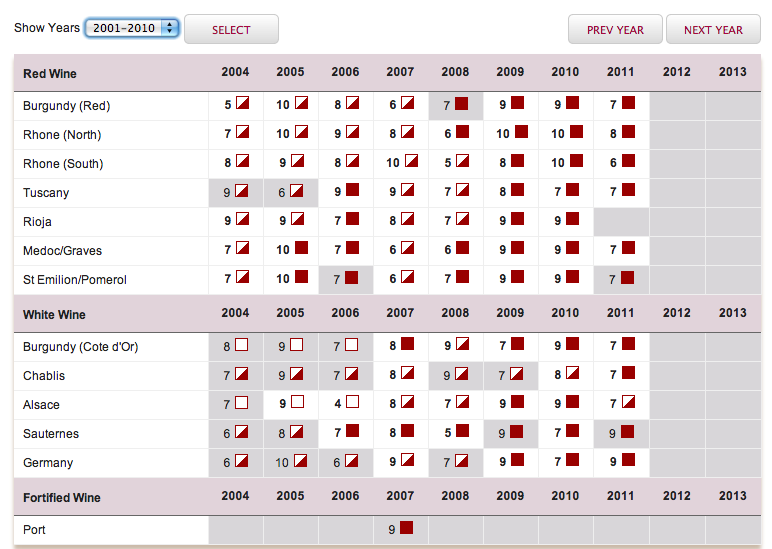 Not particularly practical if you need something on the go, but COME ON, it's an interactive wine chart. 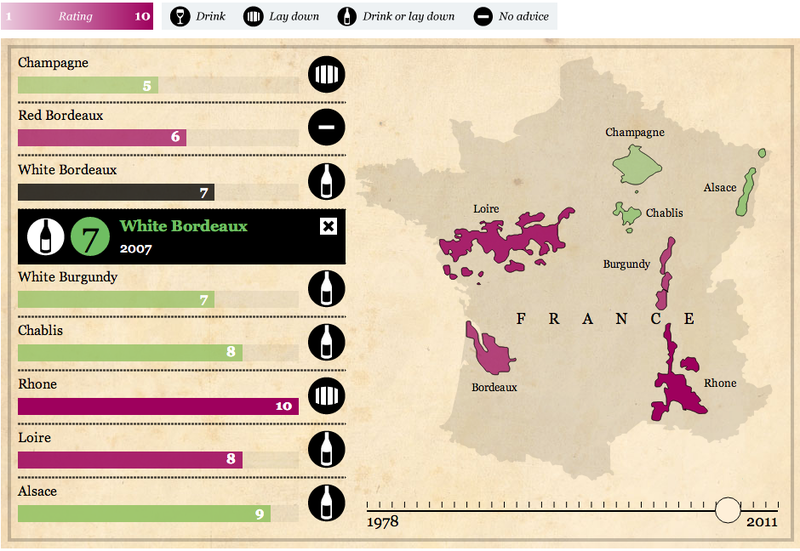 Interactive wine charts are cool.